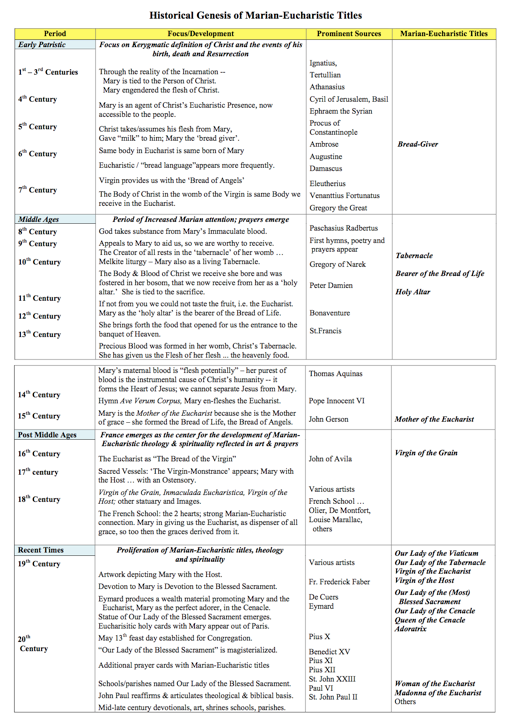 The following table is a summary of titles given to Our Lady to commemorate her relation to the Eucharist. Mary is the Mother of the Incarnation. Christ's humanity was formed in her womb without any other human participation and contribution. What does this mean for our understanding of the Eucharist? This presentation shows how tradition from the beginning (1st–3rd centuries) to the recent past (John Paul II) has couched its belief in titles given to Mary. From Bread-Giver to Woman of the Eucharist we discover the shades and nuances of a continuous veneration of Mary's role in the Incarnation. Rich May, the author of this table did not only compile the information but has done in-depth research on these titles and their provenance.